Read the complete exemplary SWOT TOWS analysis of the travel agency “Anntravel” which includes the description of the company, the evaluation of the factors, the detection of the relations, the evaluation of every strategy variant and the description of the strategy of the further procedures. If you want to see the process of the SWOT TOWS analysis creation, you can check it for free on the JakNapisac.com in the article SWOT/ TOWS strategic analysis – step by step. Choice of strategy. The example of the SWOT TOWS analysis was created based on the guidelines included there. 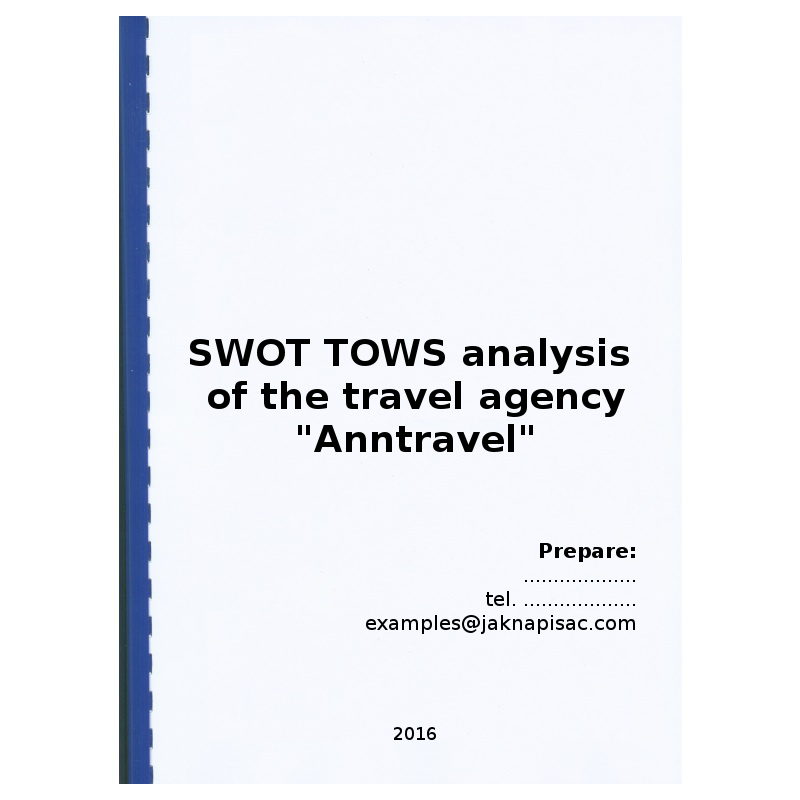 Read the SWOT TOWS analysis prepared for the travel agency “Anntravel”. The analysis is not only a table divided into four parts in which the random factors were usually written. It is a tool thanks to which you can choose a strategy for your company based on the actual strengths and weaknesses as well as the opportunities and threats present in its environment. This SWOT TOWS analysis was created because of the necessity of modification of the development strategy of the travel agency „Anntravel”, which has been active on the market for five years. The concept of the research used was to determine the strengths and weaknesses of the company, point the opportunities and threats in its environment, and then to set a strategy of the further procedures for it. The subjects of the analysis were the current situation and the forecast for the future. The travel agency deals with organizing the touristic events being limited to the territory of Poland. In the last years we observed a decrease of interest in the services provided by us because of the trips abroad. We want to explore the strengths and weaknesses of our company as well as opportunities and threats existing in its environment to determine the strategic direction of development to make it profitable. A point of reference, hypothetically, is a perfect company for which we conducted a comparative analysis determining the strengths and weaknesses of the managed company and defined the opportunities and threats which appear in the sector. The results of the conducted SWOT TOWS analysis are going to be used in the company’s business plan, which we are going to write in order to win the financial support for the activity development, and in the marketing plan, the implementation of which will let us get the assumed sale. Most of all, this analysis will let the owners take strategic decisions connected to the company’s future. It is a fragment of the text. Buy a 21-day access to the whole content. Use it to write your own document. The full text has 31 125 marks. The full copyright of the text belongs to JakNapisac.com.